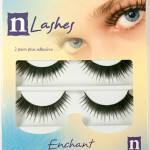 Light weight, easy to apply reusable eyelashes. 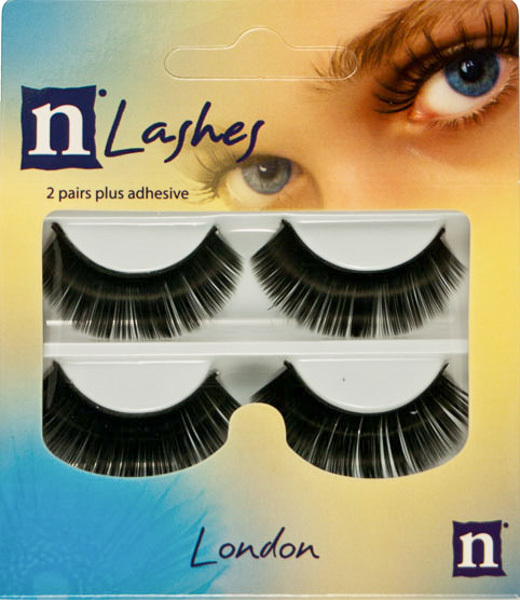 Contains 2 pairs with brush on eyelash adhesive. Remove the lashes from the tray and hold against your eye to check the length. Lashes should begin a little from the inside corner of the eye and not extend beyond the outside corner. If too wide cut off the excess at the outside edge with sharp scissors until the fit is perfect. Apply a thin line of adhesive to the lash band and wait 30 seconds before applying. Do not apply adhesive directly to the eyelid. Look down into a mirror and apply the lash as close as possible to the natural lash line. 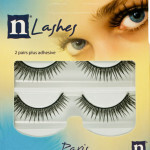 Lashes should be applied to the skin just above your natural lashes, not to them. Apply gentle pressure for a secure fit. Caution : KEEP OUT OF REACH OF CHILDRED. For external use only. Do not apply to damaged, inflamed or sensitive skin. Keep adhesive out of eye. If glue gets into the eye, flush with cold water. Always remove lashes before sleeping. Hold the lash at the outside edge and gently peel off. Replace the lashes on the tray ready to re-apply with fresh adhesive.